From Galveston we drove to San Antonio where I was lucky enough to be able to write a review for Splash Magazines. This entailed us staying at a luxury hotel and dining at a very hip restaurant. So dedicated where we to the story that we even had breakfast in bed. Almost as much fun as camping. We also made time to check out the River Walk which is located one story below street level like some sort of subterranean mirror image of the above downtown. At night it is lit up with Christmas lights and people crowd the cafes to sip coffee or cocktails. Strolling along the river bank it was easy to think we were in Europe. Then we walked into a gift shop that sold toilet paper with the President’s image on it and we knew exactly where we were. Street art in Austin. Works for us. Next day we drove to Austin where we saw a pickup truck with a bumper sticker that read “Not my President.” We were confused about the owner’s politics (sticker could have referenced either the current or future President). Other stickers, like one for the Human Rights Campaign and several for Hillary, were less confusing. Digging the progressive vibe we checked out the shops on South Congress Street. Later we went to the Texas Capitol and were greeted by the Confederate Soldiers Monument which celebrates the Texans who “died for state rights guaranteed under the constitution.” This is followed by a lot of propaganda on how the brutal north suppressed the noble southern wish for sovereignty. There is no mention anywhere about slavery. Must have been an oversight. Wanting to fit in we sponsored a bill limiting a woman’s access to birth control. Politics aside, the capitol is impressive and the people working there, as is true with almost everyone we met in Texas, are friendly. One attraction that caught my eye was an exhibit celebrating the fifty-two African Americans who served in the Texas legislature immediately following the Civil War. After Reconstruction, however, it took until 1966 before an African American was elected to the Texas Senate. No reason is given for this extended absence, but my guess are the usual culprits of ignorance and racism. That and a healthy dose of voter suppression. Something to consider as states across the country are currently attempting to limit early voting and enact stringent voter identification laws. Deep in the heart of Texas exists the amazing Buc-ee travel marts. Like Wall Drug only without the robotic dinosaurs. After Austin we headed north to the Sixth Floor Museum at Dealey Plaza in Dallas. Housed in a former book depository (yes, that book depository), the exhibits first focus on the Kennedy presidency before delving into his assassination. It is very tastefully done and left us with many “what ifs?” like “what if his motorcade sped up as it approached the expressway?” Leaving Dallas we continued to think deep thoughts and I thought of how big our country really is. Sometimes I think that the amazing thing is not that Americans are so divided but that we ever come together at all. But then a national tragedy occurs and suddenly people feel a kinship to people who vote and think differently than ourselves. What if more people were able to drive instead of fly across America? What if that led to more open conversations? What if indeed. Indiana Jones would hate the Phoenix Herpetological Association (PHS). For starters he probably would not be able to step foot in the room housing the largest venomous snake collection in the world. 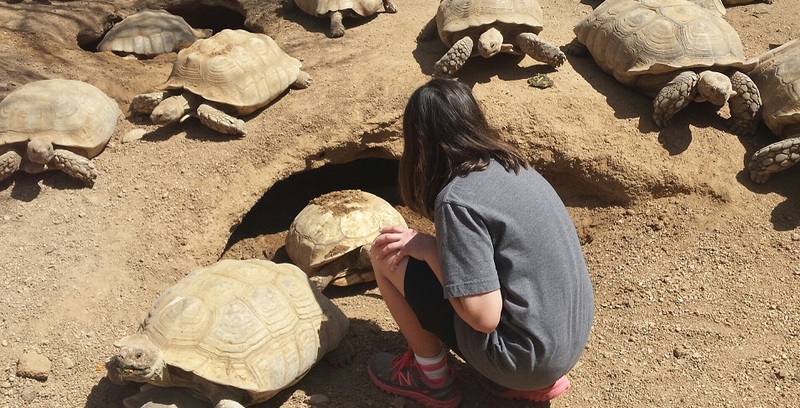 But for everyone else, the Herpetological Society is an over-the-top spectacle of reptilian delight where monitor lizards and Galapagos tortoises (to name just two of the guests) are allowed sanctuary from poachers, developers, and other belly crawling beasts. The PHS has two overlapping goals; rescue and rehabilitation along with conservation education. 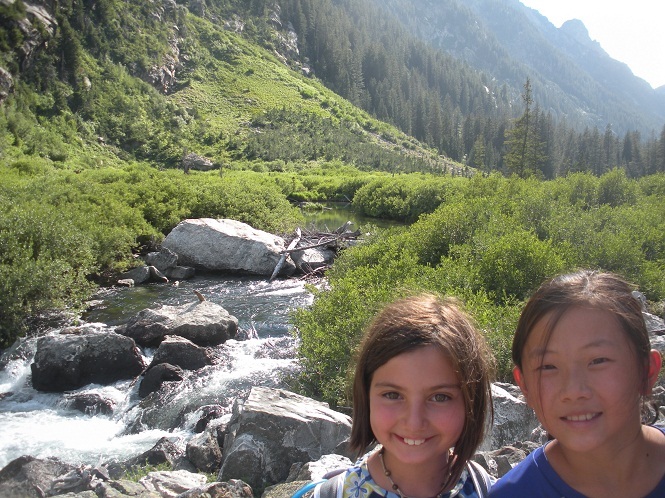 Conservation education is accomplished in part through camps and by facility tours. Leading our tour was Daniel Marchand who, along with two other partners, converted his family’s home (situated on a large desert tract in northern Phoenix) into a mighty impressive zoo containing over 1200 animals. Many of the displayed animals used to be a lot smaller and someone’s pet before growing into a difficult to manage size. Other animals, like an albino rattle snake, were rejected by the next-of-kin after it killed its original, very careless owner. Still other animals are government property seized by would be smugglers of exotic pets. The PHS also exhibits twenty-one of the twenty-three total type of crocodiles in the world. Included in that number are two aggressive salt water crocodiles (the same crocs’ that routinely eat Aussies and tourists in the land down under). 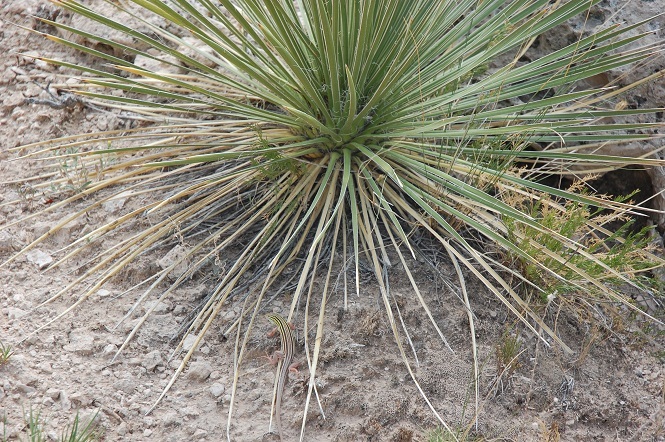 These suckers are large and have been known to purposefully lure caregivers a little too close to their chomping teeth. Maybe that is why Daniel never turned his back on or strayed too far from the exit when entering their lair. From talking with Daniel it was clear that this no-kill shelter does not like to reject any animal, whether it be warm or cold blooded. Which explains why the tour includes a beaver and an overly friendly raccoon. 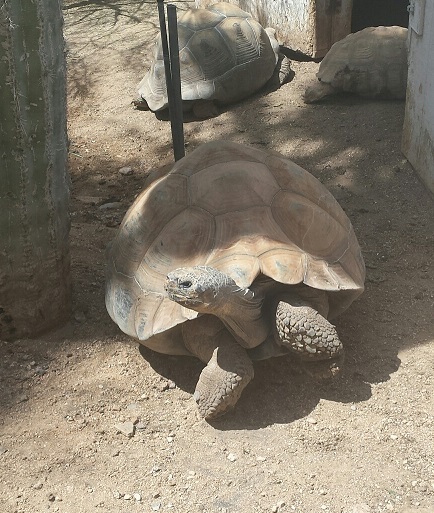 Some of the exhibits were hands on and we especially enjoyed the opportunity to walk among the African tortoises. Henna also allowed a non-venomous snake to crawl over her shoulder. But it was Daniel’s obvious love and willingness to share what he knew of his animals that made this four hour tour feel half as long. I will never look at a lizard the same way again. 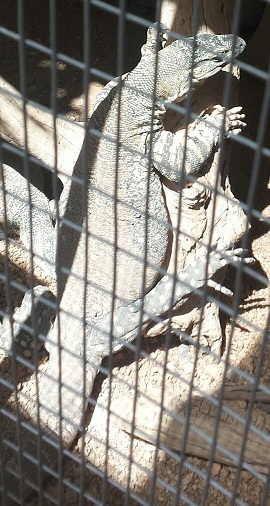 All tours of the Phoenix Herpetological Society are reservation only. For information on how to book such a tour or about their various children camps, click here. 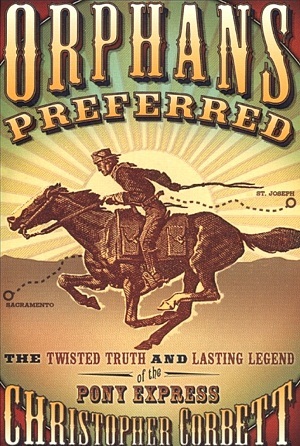 Orphans Preferred (by Christopher Corbett) is not the easiest read. Truth be told it took me a few starts and stops before I was able to read the thing cover to cover. Like the Pony Express itself, the book tends to cover the same ground over and over again without ever really declaring what the true facts of that endeavor were. For example, it is not yet settled as to who took that first run out of St. Joseph, MO. What is certain is that the Pony Express was never profitable and did not last very long. Also a certainty is that the true heroes of the Pony Express, men such as Pony Bob Haslam (who once rode 400 straight miles in the midst of an Indian uprising) are mostly forgotten whereas others such as Buffalo Bill (who may not have actually ever ridden for Express) are forever linked with this privately run mail enterprise. It is in the retelling of the legend of the Pony Express that Christopher Corbett shines. 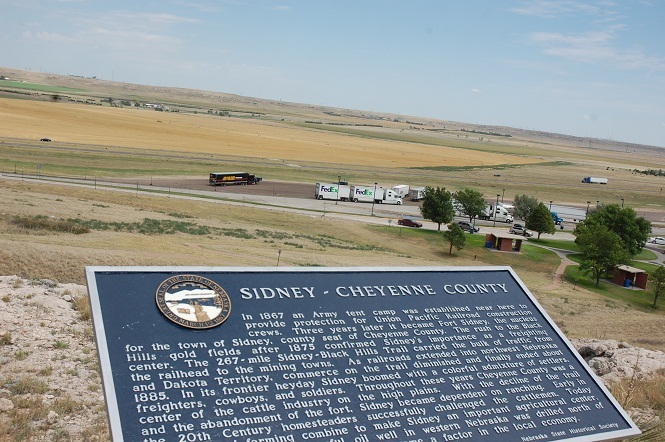 I have twice spent the night in Cody, WY (a mostly Disneyesque Western themed town that William Cody created) but never understood just how popular the man was. Buffalo Bill and his Wild West Show were as big as they get in his time and he extensively toured Europe and America (and even performed before most of European royalty at Queen Victoria’s golden jubilee celebration). A big part of that Wild West show was always an incredibly fictionalized account of his Pony Express experience (which in actuality may have only consisted of him feeding some horses). Hollywood later seized upon that legend and to this day the Pony Express conjures images of an untamed West filled with an adventure. That same Hollywood West has always captured my imagination and is a big part of the magnet that draws us west most summers. Truth be told, the real west is better than the legend. It also is a lot more fun. From one western college town to another. Today was the longest drive of the trip. At almost exactly 500 miles, it was one of the longest drives we have taken in many years. Take one interstate, one very flat route, and precious few roadside attractions and….zoom we were off. It was all rather anticlimactic really. 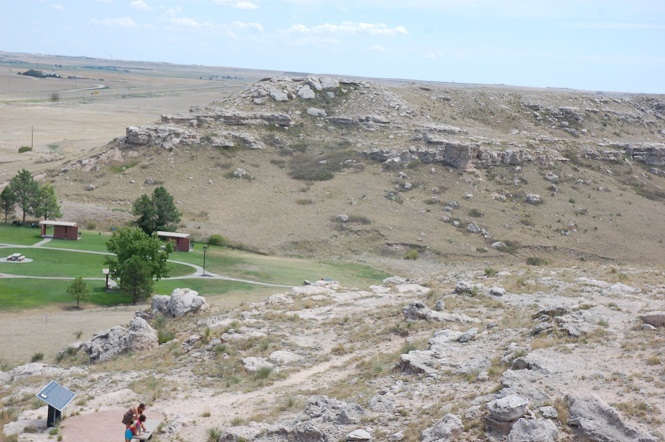 In Laramie the mountains were near but out of sight and the ground still buckled everywhere. Cross into Nebraska and the land still buckled a bit until, maybe around North Platte, it suddenly flattened out into the mid west. Highlights of the day were a short hike at a rest stop (in the still buckled part of Nebraska), a plaque at that same rest stop celebrating the “golden link” of “concrete and steel” that was completed in 1974 (that golden link would be Interstate 80), a text with a neighbor, a free stay at a hotel thanks to points earned, and a Mediterranean fast food meal in Lincoln. The text by the way would be with our neighbor Alex whom, along with her husband Chad, will be celebrating Chad’s mother’s birthday this weekend in Iowa City. Lucky for us they invited us to the party and we cannot wait to see them tomorrow. Chad and Alex, if you are reading this, we will see you tomorrow. And for all family and friends, our journey is expected to end this Saturday. We have had a blast sharing our adventure and hope you continue to check in with us over the next few months as we add photos and share more stories. Thank you for staying with us these past 7 weeks. It was kind of hard yesterday saying goodbye to the Signal Mountain campground. 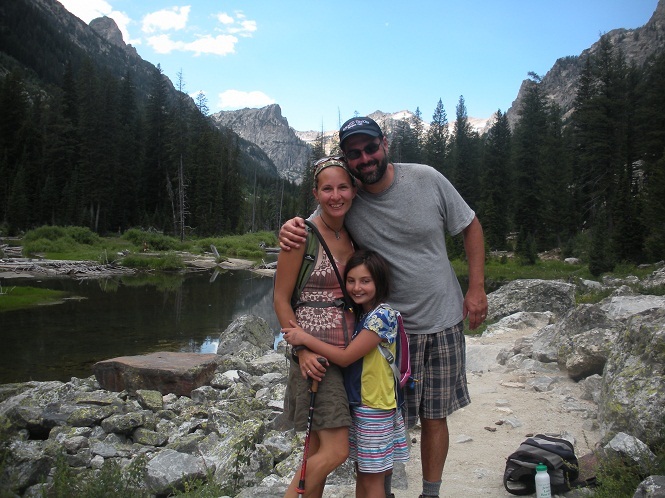 Our five nights spent there (we also spent one night at Colter Bay) was camping at its best. We made friends, learned about slightly off the beaten path destinations, and were given food by our neighbors. Those neighbors, by the way, were the best neighbors outside of Edison Park that a family could ask for. 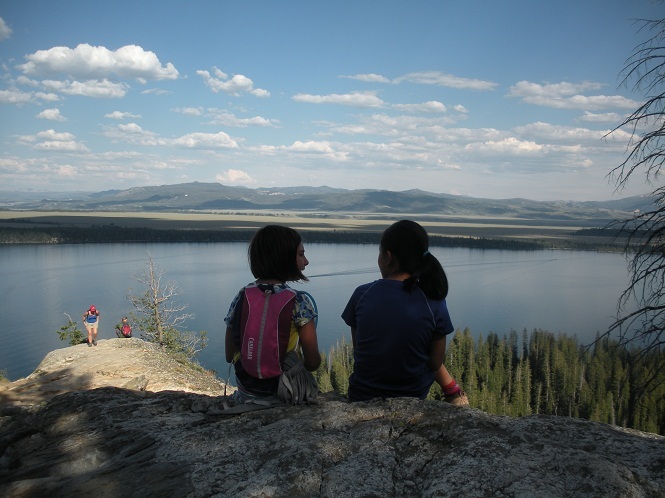 Although laid back and friendly, they were also experienced campers. For example, when a mother black bear and cub wandered around just below our campsite they were able to point it out to us without disturbing their feeding. For that last morning we woke up to a coming storm and were able to pack up just before the rain came. We waited out that rain then had a good breakfast which finished just before another storm, this one with hail. After a final goodbye to the place we followed that storm east to DuBois. The rain and construction slowed us down but we did spy another mother bear and cub by the side of the road. Later in the day Henna and I saw dozens of antelope and we may have also seen a wolf (Corey got the best look at the canine-ish animal and she is certain it was a grey wolf). Other highlights of the day were coffee and ice cream in Landers, WY (where the diner had mismatched coffee cups and more wooden Jesus’s and other saints than you would think possible). Landers had a bit of a gritty feel along with many opportunities to pawn your stuff (possibly to get enough money to buy a drink at one of the dozen or so dark saloons in the town square). There also was a neat little park near the train tracks, many friendly people walking around, an Asian grocery store, and an excellent antique shop. No bookshop though. Laramie we could live in, maybe. I did not find a bookshop, but the college town must have at least one. We did have excellent pizza at Grand Avenue Station where the artists there create masterpieces out of wheat or white dough, feta cheese, barbecue chicken, or whatever else you think might be a good idea. The main drag has buildings dating back to the late 19th century that now host coffee shops, boot stores, funky bars and other strange pairings of the wild west and a hip college town. Before these western towns we drove through endless high desert filled with unexpected bright colors and rounded off mounds. 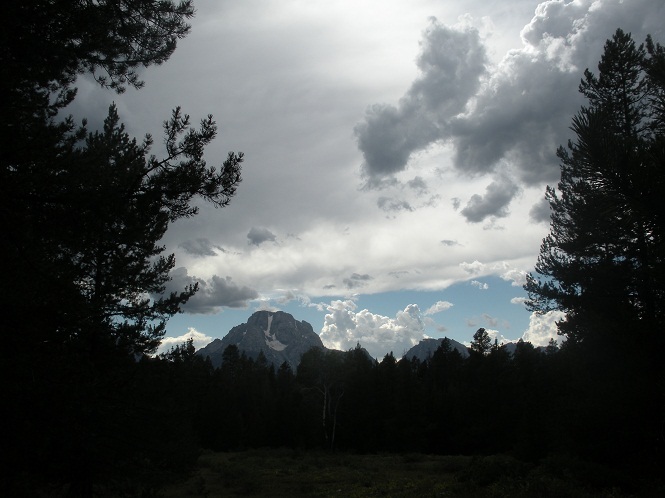 The high mountains of the Tetons and the Wind River faded in the background and the altitude trended down. 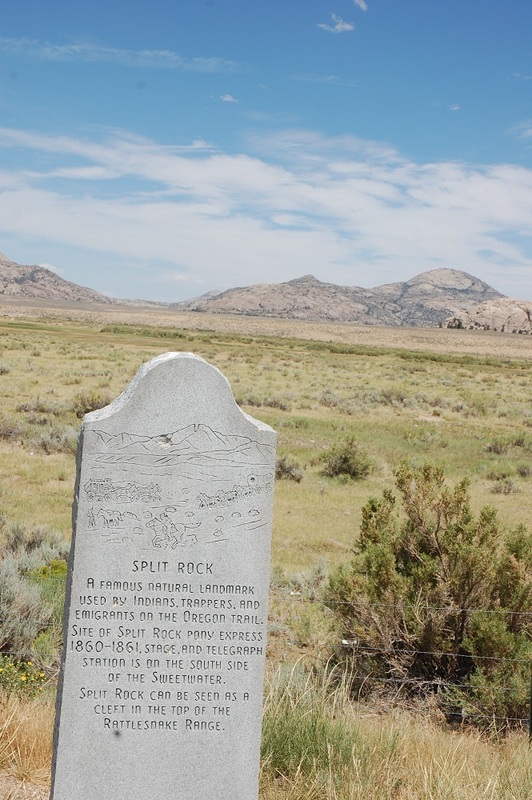 Along the way we stopped at Split Rock which was a physical landmark for folks headed west along the Oregon Trail. These are the last few days of our trip and we are already reminiscing about it. It has been a good one and we hope you stay with us for these last few days. Our last day in heaven. That’s what it felt like anyways. After driving 5,500 miles or so in about 6 weeks it felt good to anchor ourselves in one spot. In six nights here we hiked close to 20 miles and swam almost every day. We also made friends with two families (both families included a Mike), ate out a few times, and slept in. The storms came almost daily, but so did the sunshine. 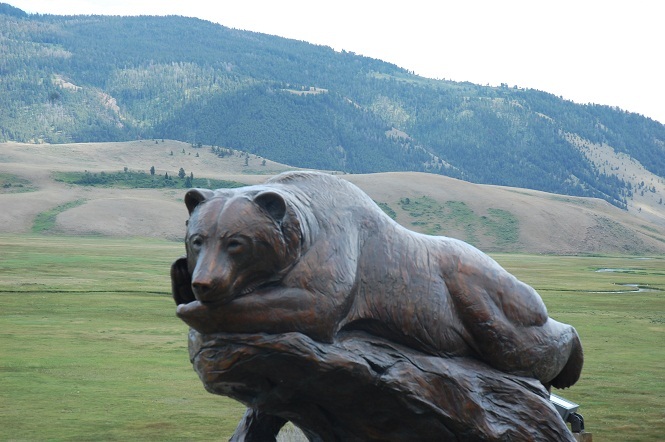 We also visited Jackson Hole three times and by the final time (today) felt that we actually saw the small shell of a time shellacked by the great tourism world. How we came about this core was through the usual methods; a haircut. Woke up this morning around 5:00 AM and may have accidentally woken up Corey and Henna. Instead of going back to bed we talked a bit and decided (with a strong dissent by Henna) to get up and take showers. That is how stinky we were; Corey actually agreed to leave the tent before six in order to take a shower. The nearest shower was Colter Bay (where we camped the first night). So off we were a little after 6 watching the sun finish its rising and keeping an eye out for wildlife. We saw many elk and a coyote and were clean and back at our campsite around 7:30. I should mention it was in the mid-40s the whole time we were up. I made coffee, Corey yawned a lot, and Henna went back to bed. Around 10 we were properly caffeinated and full of yummy pancakes. After the haircut we hung out at the National Museum of Wildlife Art. Although I was bummed my NPS pass did no good there and $12 an adult/$6 a child (or $30 a family pass) seems a little steep (my NPS pass which allows our family entry into any National Park for a year is $80) the museum really is cool and worth the money. Henna got an almost hour long lesson on water colors with the resident artist and their exhibits are fascinating. They are in the process of creating an art trail around the building too and when completed this will almost definitely be a premier destination as it is nestled just at the entrance to the park (and the building is a fascinating blend of stone). I do wish they were more generous with their WiFi, but the people working there were friendly and the galleries were not crowded. As the afternoon storm rumbled outside, I worked on these paragraphs while nestled into a plush leather couch with views of the foothills. Not a bad way to spend my last day in heaven. Before you call DCFS please read fully. Today began with a plan to hike up Signal Mountain whose trail lies across the road from our campsite. 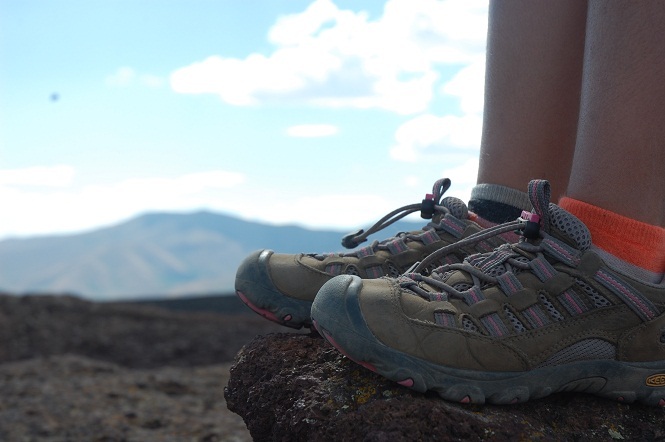 This hike was described by a campsite worker as short and ugly. Knowing that nothing coud be ugly in this glorious place, we decided to believe only the short part. 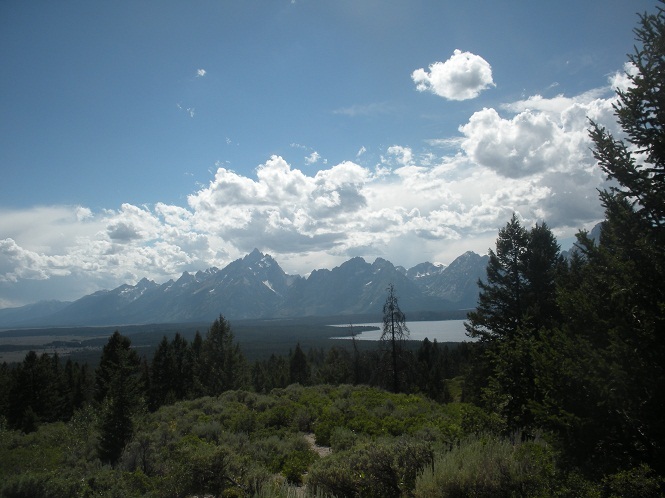 So after a harrowing walk along the road to the trailhead we hiked 3 miles to the mountain summit (over two hours) only to be met by tons of tourists snapping pictures of the glorious teton range view (I should mention there also is road that will take you to this very spot.) We must have looked mighty out of place among all these clean people; as we were tired, sweaty and eating scraps of squashed food from my camel back. Henna was so tired she sat right on the ground not caring that people had to walk right over her. A nice looking man asked incredulously, “Did you hike up here?” To which we proudly answered “yep”. What came out of his mouth next was the last thing we expected. He looked right into our over tired and sun streaked eyes and bluntly asked, “Why would anyone walk when they could drive?” How do you reply to such a forward and insane comment? You don’t. I simply turned to Henna who at age 8 had hiked up this summit, not so pleasantly at times I might add, and asked her if she would do it again. She replied without hesitation, “Yes!” I thought that was all the response that was needed. Her reasons can be best described in the pictures that follow. Boy do I love this kid. Another day another hat. My fourth hat of the trip (in case you are scoring at home) and this is the first one that would not look odd in Edison Park. However, with my very overgrown beard, dark glasses, and Teton baseball cap I do look a little like a wanted bank robber. 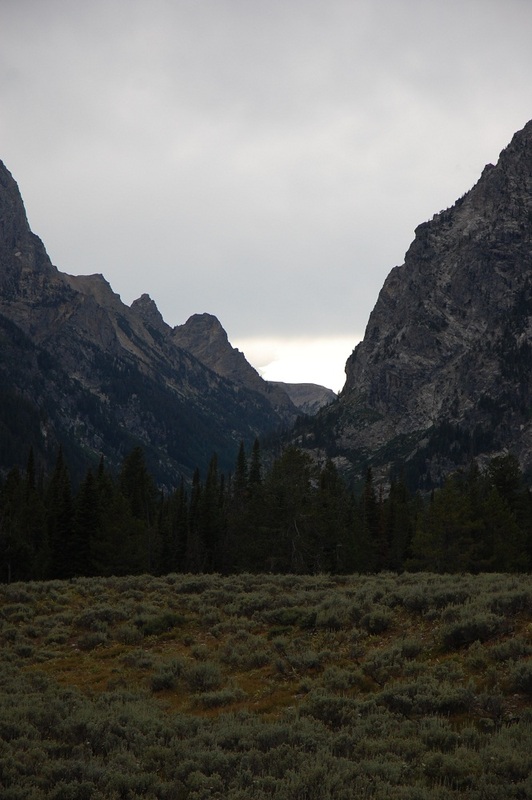 Yesterday we hiked up to and through Cascade Canyon (which we also did last year). 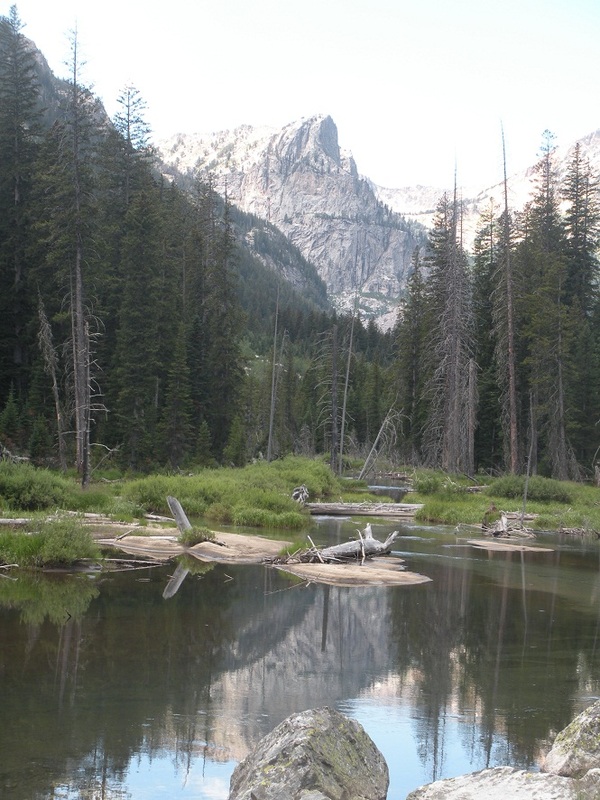 This is probably the most popular hike in the park as it combines a short boat trip to the opposite shore of Jenny Lake, stunning views of the lake from Inspiration Point, and then even more amazing views of the surrounding mountains which form the canyon walls of Cascade Canyon. You can take the shuttle boat and hike .5 miles to Hidden Falls then return back or backpack through the terrain for a month. 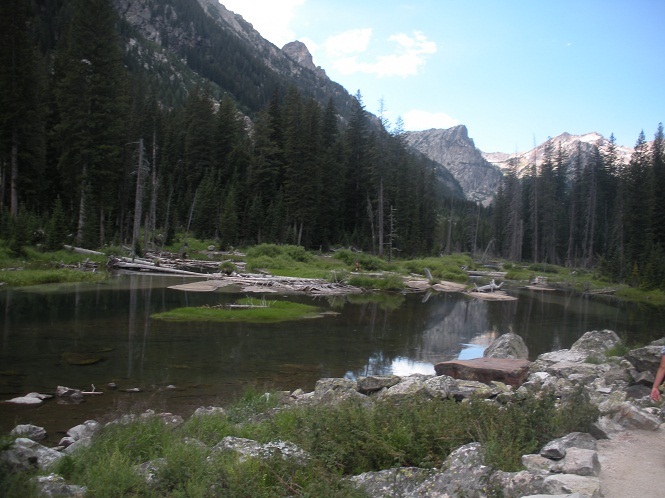 14 years ago Corey and I backpacked to Lake Solitude (our first backpacking trip). Yesterday we hiked to a pretty cool water fall just past the Cascade Trail fork (round trip 9 miles). 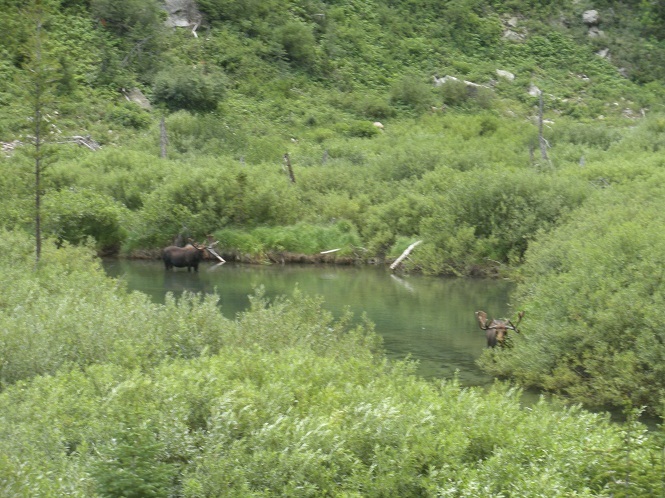 We saw two very cool bull moose along the way and, even more exciting, made some good friends. Our new friends are Grace (age nine), Mike and Kerri. 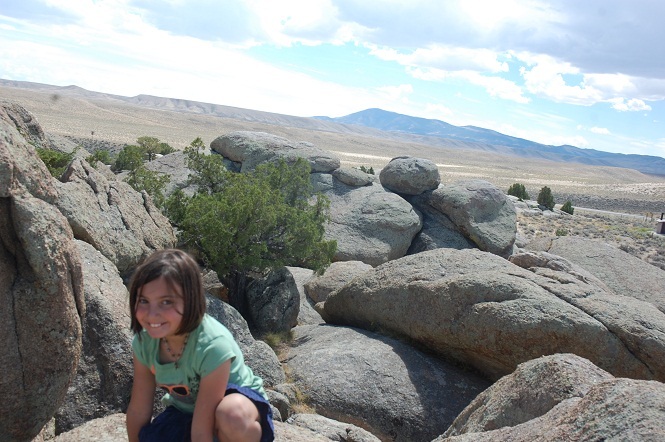 Grace is nine, loves books, is read to by her parents at night, and enjoys camping with her parents at various national parks. 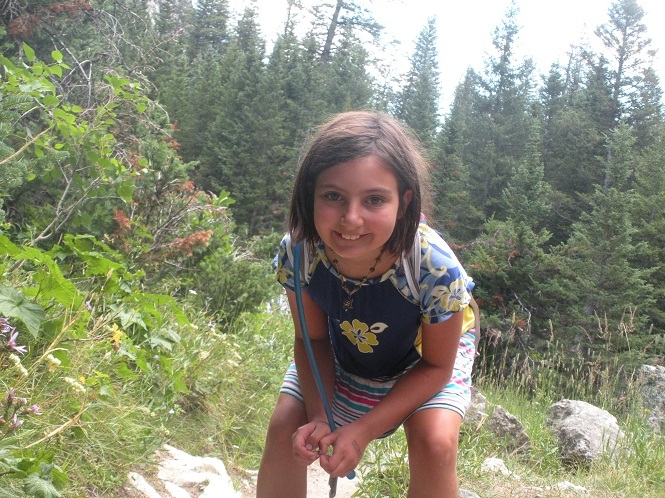 Henna is almost nine, loves books, is read to by her parents at night, and enjoys camping with her parents at various national parks. Both girls are also kind of shy and love digging in the dirt for rocks and such (although Grace might like bugs more than Henna). A quicker friendship has never been. Grace’s parents are also very cool and, amazingly, know William Least Heat Moon (or Bill as Mike calls him)! Mike, being a professor of geography at Missouri (MIZZU) also knows a lot about rocks and other cool things (as well as Seinfeld trivia). Kerri has a good sense of humor (she laughed at my jokes) and has a love for all things literature. We talked books (Grace has read many of the same books at Henna), living abroad (they lived in China for a year), climate change (one of the few conversations related to the subject this trip that did not include calling our president a Marxist), and bug based ice-cream. We barely made the last boat back to shore and ended up eating together at the Signal Mountain Lodge. There we sat tired, filthy, and slap happy. I could not have asked for a better time. 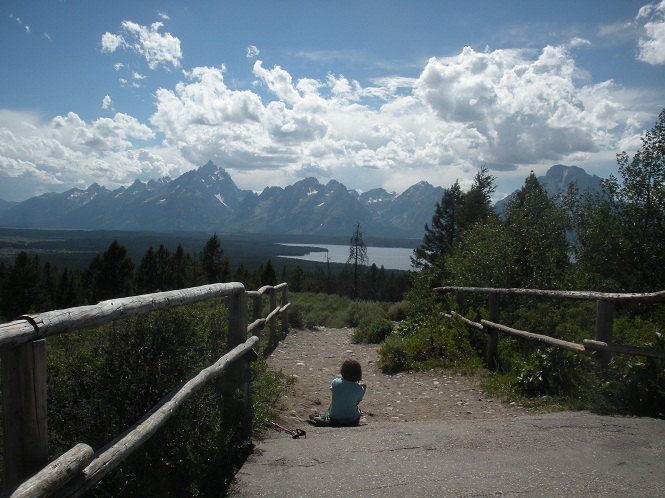 We have been living in Grand Teton National Park now for a couple of days. I like it. 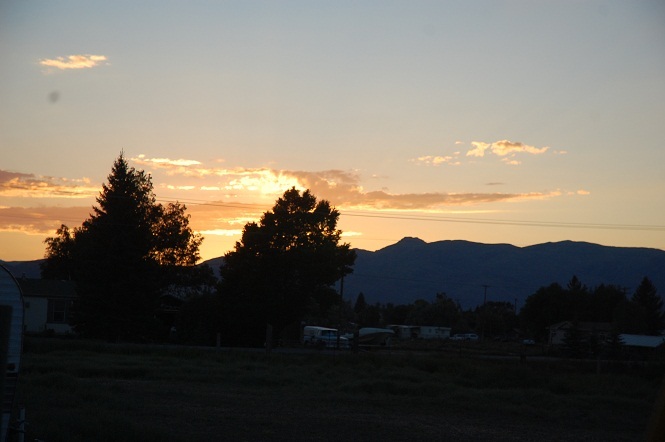 We have some great neighbors, lots of hiking and swimming options, and good mountain views in every direction at every time. 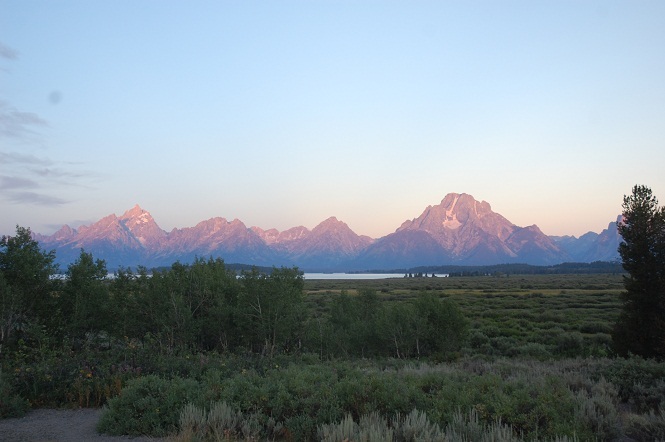 The town of Jackson (better known as Jackson Hole) is just a short drive away and that is where we went last night to fill up the tank, eat some Thai, and get new wedding bands. After a couple of false starts that included a very handy salesperson who tried pushing 70s disco era stuff, we found our rings. 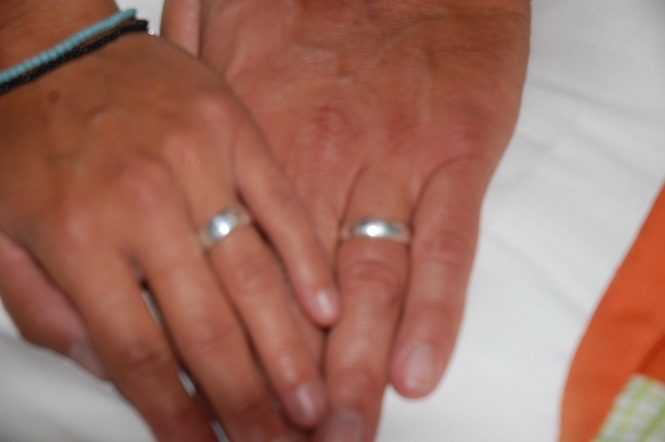 Sterling silver, they did not fit us exactly right but after some hammering they were ours. We celebrated with some Thai food. All was well at the restaurant until the gun shots started. First it was one pop (maybe a car backfiring? 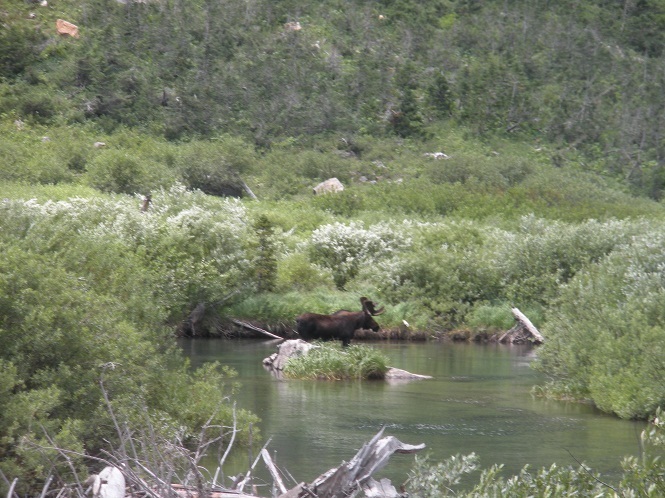 ), then a few more, and then finally a steady barrage of bangs that appeared to be occurring less than fifty yards from where we were dining. No one else at the place seemed to mind so we did not panic. Later I found out it was the nightly shoot out staged on Maine Street twice a day. Funny, some people drive all the way to Wyoming to escape their urban woes. Those same people then ooh and ah over a recreated shooting. Maybe the nightly news should take Jackson’s cue and, instead of merely telling the news, use actors to recreate the daily mayhem. It still might be depressing, but at least it would be more entertaining. Before heading into town we made some friends and I picked up a nemesis. I will tell you about the friends first. A few sites down from us live Mike and Nicole who hail from Pomona, IL (the heart of one of my favorite places in the world, Southern Illinois). Father and daughter they are the advance team for an adventure oriented co-ed youth group that plans on camping a couple of weeks in the Tetons (co-ed teens camping together for an extended period of time, what could go wrong?). Mike has been here before and knows the park well. He also knows quite a bit about camping in general and has the easy going knowledgeable manner that makes for a great neighbor. His daughter is headed to Chicago in the fall with her husband with a theatre background and a desire to make it in the big city. As cool and friendly as her father we hope she makes it big (and ultimately invites Corey, Henna, and I to NYC to watch her perform on SNL). Mike and Nicole shared a few huckleberries with us and, more importantly, shared where they picked them. Henna was enthralled and the hunt was on. On the way to the huckleberry patch I met my foe. 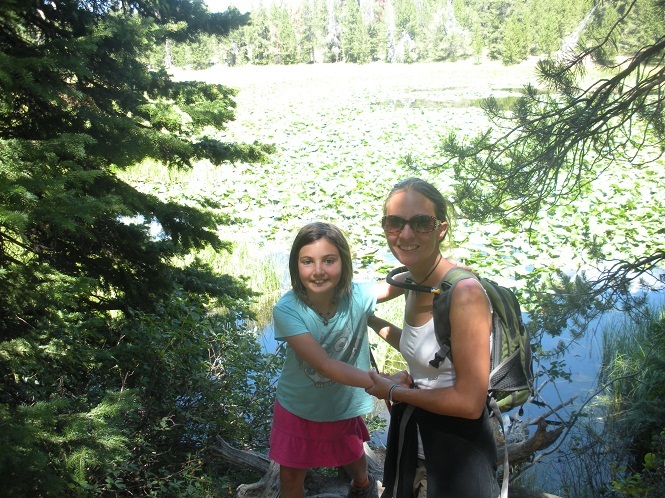 She was walking alongside a trail with her young son and seemed sweet enough at first. 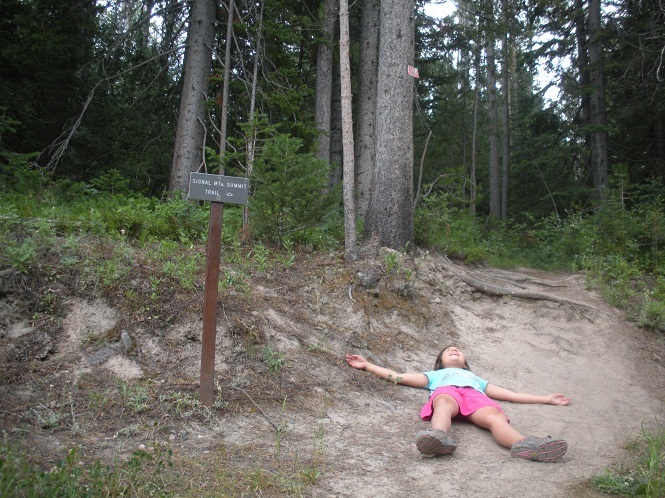 We asked her directions to the String Lake Picnic Ground area (an essential first step in our search for the elusive berry). Her response, “you don’t want to go there.” I did want to go there. “Well, you can swim right here, I mean it is the same lake. Over there it is just crowds.” I felt a little defensive and told her about the huckleberries. She did not respond to my excuse (and does anyone really need an excuse to go to a popular tourist destination?) but instead added “I mean some people like that sort of thing especially if you have never been here before.” “I like huckleberries,” was my response. She again ignored my reason for searching out what to her must seem like the worst excesses of a National Park loving society. What got me going was how defensive and competitive I became. I suppressed it well, but in my head I was listing all the hikes, roads, and parks we have been just this summer where people were few and the views many. But the thing is there is always someone who can trump us. Mike for example has out camped and hiked us many, many times over. Later on the trail we bumped into a family living out of a tent for a month (like us) but (unlike us) have three small children with the youngest about a year old. 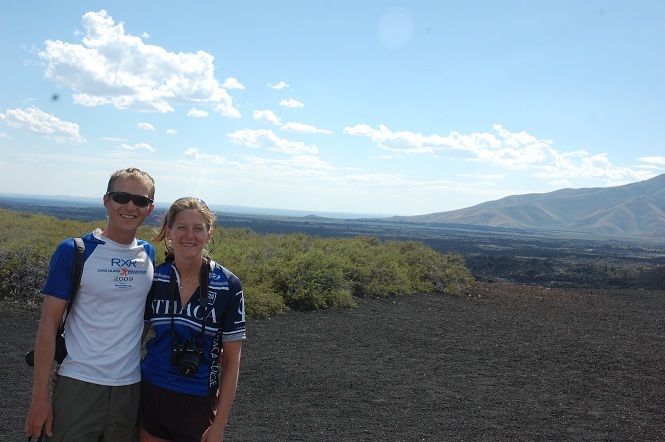 We also have met people cycling, hitchhiking, and walking the same terrain we have driven. And all the people just mentioned have grace. They live the way they do not to gloat but to more fully enjoy life. “Love the life you live, live the life you love” is on every e-mail Corey sends out. That should be enough. Pushing 6 weeks here and the last few days were wearing me down. Yesterday revived me greatly though and ended around a gas fed fireplace with new friends playing tunes at our request. Leading the group was a camper with a lot of guitar and vocal talent. Joining him were the campground owners (who also had a lot of musical talents that included song writing) and a local Arco resident on keyboard. Sherri (the matriach of the campground owners) not only warmly invited us into the circle, but also let Henna drum along on a hybrid tambourine/ bongo instrument. Their daughter joined us too and spending the night at the KOA in Arco, ID felt almost as good as hanging out at Dan’s house in Santa Cruz. 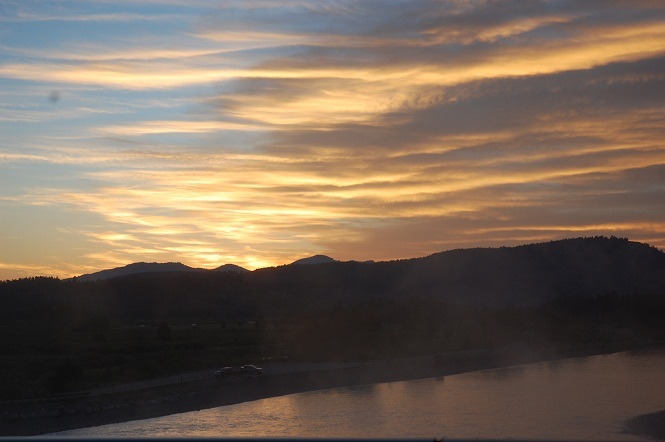 While the sun set over the mountains I shut my eyes and felt the temperature dropping as my spirits rose. Sherri and Neil were the last of several very cool people met yesterday while driving to Craters of the Moon National Monument. We did not know what to expect both in terms of landscape and people and were pleasantly surprised by both. First down the line was another Aussie (they are everywhere!). It was off the interstate on HWY 20 with a lot of empty spaces in all direction. At the Hill Saloon, the only business in town, there was a small general store, dusty pots with cold coffee, a former post office, and an old fashion bar in back with wooden floors. All this was in a building smaller than a convenience store. Tending bar (and the only person in the store other than us) was the aforementioned Aussie. Unlike most Australians she was rather shy and volunteered little information. When I asked how she ended up there, she stated that the owner had to go into the city for business. I then asked how long she had been in Hill and she replied one month. I felt like she left the best part of the story out. 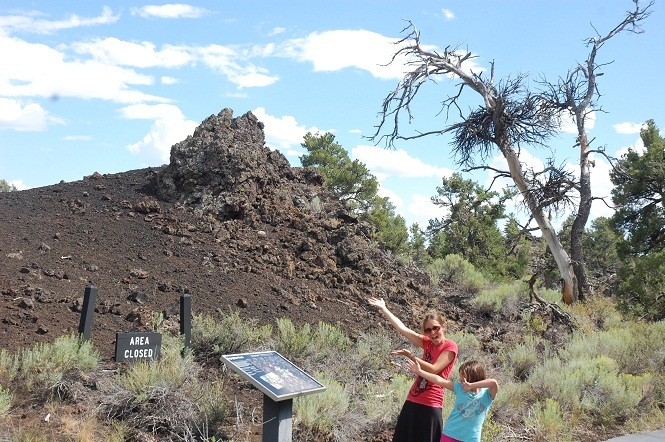 At the National Monument we were treated to endless cooled lava fields than spewed some 2000 years ago. 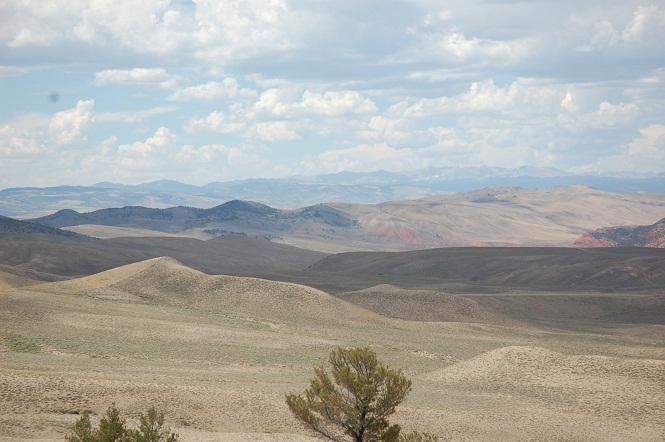 Like much of Idaho and Wyoming and, for that matter, the entire west, the land beneath is a seismic mess and continues to pull, raise, and drop the land in sudden spurts. The last big movement occurred in 1983 with an earthquake that saw the valley drop eight feet and a mountain rising a foot. Every 2000 years ago lava flows freely. The last time this happened was 2000 years ago. Better see it quick. 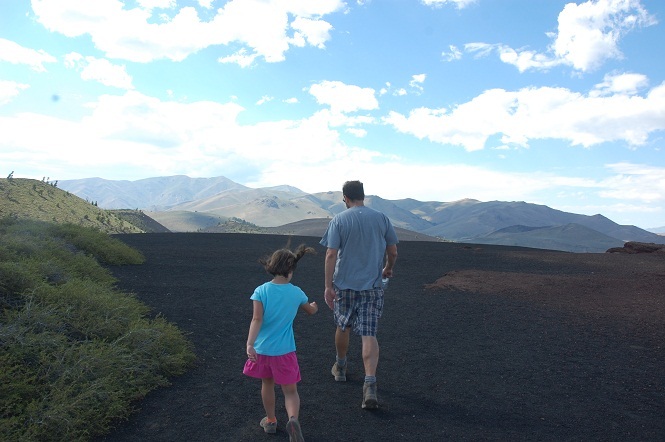 Craters of the Moon has a wonderful 7 mile loop with several short hikes that take you into the landscape. 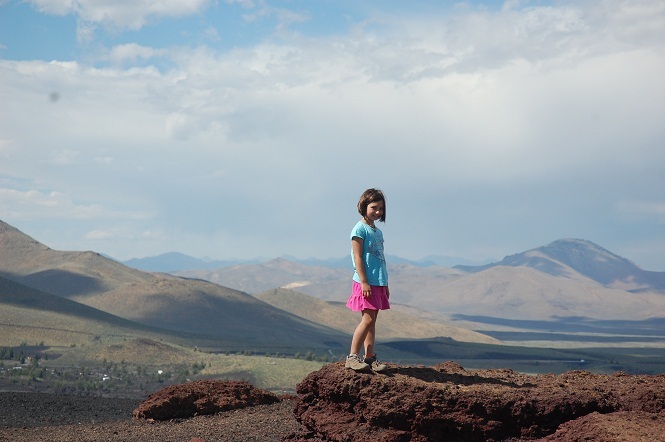 We climbed a cinder cone, walked among the lava rocks, and explored a lava tube. We also met a couple cycling from Michigan to the coast. Teachers, they were doing this partly as a way to raise money for their school. Talking with them we realized that they had been to many of the same places we have, but on bike. While at the visitor’s center the supervisor of the park approached them, introduced himself as an avid cyclist, and invited them to crash at his house for the night. He also had let them borrow a car to drive into town. Later at the campground I met other educators, this time from the Netherlands. Hank teaches students with Autism (age 15 to 22) and his wife (Katharina) is a counselor. While their English was very good, they had trouble answering my questions related to what special education looks like in Europe. My coffee is percolating, the ladies are sleeping, and we are headed to the Grand Tetons (Uncle Mike from Klamath said that name always cracks him up) today. We might spend up to five nights there; we might not. Either way we are going to enjoy our last week and change on the road as much as we can. Talk to you all soon.